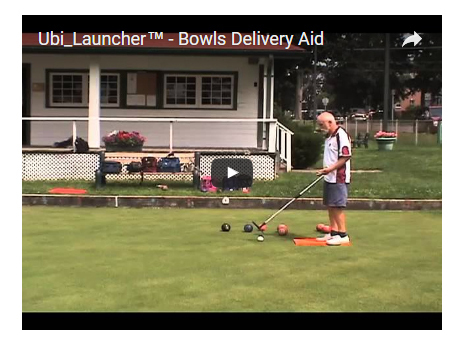 This Lawn Bowls delivery aid is lightweight (40g or 14.2 ozs), adjustable, durable and most of all affordable. If you suffer from a bad back, back hips or bad knees then the Ubi Launcher™ may be just the delivery aid you've been looking for. Just a few short minutes and you should be back playing the game of Lawn Bowls that you love. There is no grip strength required as there is with a bowling arm. At the end of your game you can easily undo the two pieces and transport the Launcher section in your bag and carry the adjustable pole alongside. It collapses to a reasonably short length! So why not start a Bowls trend that saved the game of Curling? Has the Ubi-Launcher® been approved for official play? World Bowls have said it is up to the local associations to determine to what extent any delivery aid may be used. They also point out that any local associations should be very aware of the disability laws regarding making our sport inclusive for all before making their decision. Bowls England and Bowls Scotland have resolved that the Ubi-launcher may be used in all events under their jurisdiction. in provincial playdowns leading to national championships in the majors (fours, pairs, singles) if prior notification of its use and approval is subsequently granted by the National Officiating Committee.